Are there any other link? Trying to get back into Estiah after some time too busy with RL, had changed computers and so needed to re-install the script. External replay site was down causing normal install to fail for some reason, so I just copied over the files from backup of old computer. Seemed to install just fine, but then the extra gears never came up. For some reason it seems like only a handful of the add-ons are actually being loaded by the script. The script has been like this for me for about a month now. I restarted Firefox one day and almost all the features had disappeared. 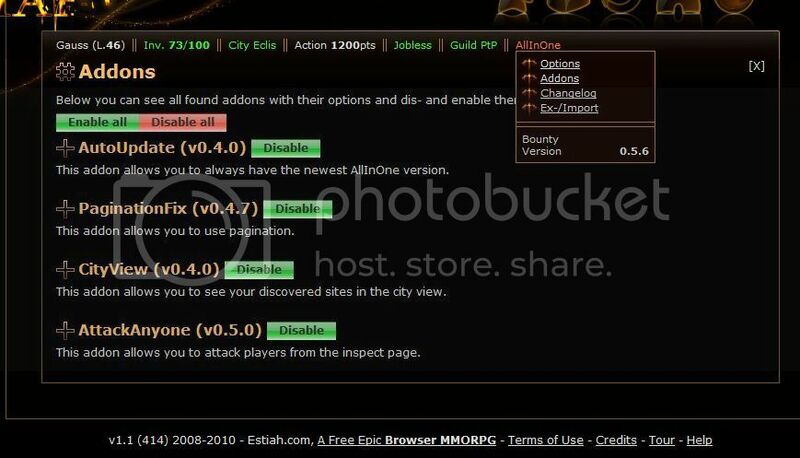 I've uploaded my copy of AIO here. I have that problem, too. I change version back to 3.1.1 and problem solved. Many thanks, AllInOne now working. Now to get Mind Tricks functional... ("GM_getValue is not defined"). Suppose I should go post in the relevant thread for that. FYI the AdvancedReplay portion of AllInOne does not appear to be compatible with the newest version of Firefox (39.0.3). Anyone found a solution for this yet? I have the exact same problem. I've downgraded greasemonkey to version 3.1.1 but it doesnt help. I've also copied the script from my old machine (v.0.5.6 too) and it also doesnt work (download bar is empty).